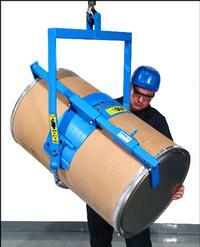 Lift, Move and pour a drum within your reach using a monorail or crane. 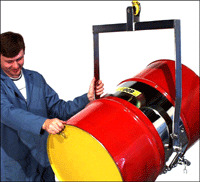 You manually control the tilt angle of the drum for fast dumping or for controlled dispensing. 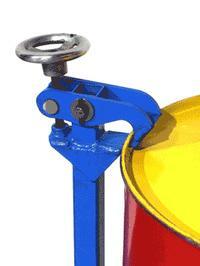 Use the built-in tilt lock to hold a drum vertical for transporting or in horizontal position to pour. 500 Lb. 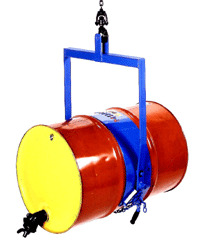 (227 kg) Half-full drum - Half-Full Drum Rating is an indication of capacity for tilting unbalanced, bottom-heavy drum. Partially full drum with unbalanced and shifting load is harder to tilt than full drum. 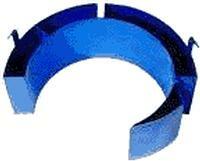 Please call ZORIN (888) 378-6525 for optional drum diameter adaptors.